A little while back someone sent me a link to an interesting website. On it, they said you could rent a gaikokujin (foreign person) who will do various things for you, depending on the person. They could speak English with you (seems like the most obvious application), be a model, DJ, write, be a bartender, hang out with you, etc., etc. As long as it is legal and the gaikokujin is willing, your imagination is the limit. Looking at the website, it was apparent that two gaikokujin were available for rental. One Australian with dark hair and a smirky smile and one American with a beard and blue eyes. Turns out they are the co-founders and they have had many clients between them… too many, in fact. If you're a gaikokujin in Japan get in touch with these guys. They're looking to add some folks to their roster. You can visit their website at gaikokujin-rental.jp. Although they are in their early goings over at Gaikokujin Rental, I thought it was an interesting idea. I also had no idea what it was they were doing, so I sent them an email asking if they'd be willing to do an interview. They were very gracious and got back to my questions super quickly. What follows is said interview, and it includes stories, success stories, and information on what the heck all this gaikokujin rental stuff is all about. Two guys, one Australian and one American. Both have called Japan home for a handful of years: Six and ten respectively. 2. Why did (you) start it? "Why has someone not?," is what we have been asking ourselves for years. Peer to peer business in Japan has always been BIG. Big for both client and contractor. Yet it seems every year the market is not adequately accessed, and unfortunately for many the public space for self-promotion is in, we feel, terminal decline. For-hire platforms available at present are largely top-down corporate to individual, not peer to peer, and we think peer to peer is important and remarkable. We think it makes for new economy. Also, we feel Gaikokujin Rental serves as an alternative meeting space to the usual foreigner/Japanese social venues which exist in Japan today. Author Note: Oh, so it's like AirBnB but for people and their skills/time. Now I'm starting to get it. 3. How long have you been renting foreigners? Gaikokujin Rental officially launched on November 29, 2013. 4. It looks like you have two people being rented out. Who are they? They are the co-founders, Austin and Adams. 5. Are you looking to add more people to rent out? We are actively looking to add more foreigners as well as increase Japanese readership at our site – We wish to bring as many people together and build as many success stories as possible. To this end, we have invested energy and time into the idea, sustainability and scalability of Gaikokujin Rental. 6. What kinds of things have you done? I need a bedtime story. I once had a woman hire me to look after her children and clean her house. I was hired by a Japanese women to go shopping with her and pick out a birthday present for her husband because he was a foreigner. I was asked to attend a bonenkai with a group of salary men and speak only English with them. I was asked by a young Japanese couple to come to Kyoto and take pictures of the two of them. Well, it started around 8:00 on a Friday night. I got off from work and was asked to meet my client at Nagoya (Meieki) station. We engaged in small talk for a few minutes, after which she asked me if I could do two things. The first was to check some English paper work which she had been given by her boss. I was asked to explain it and help her with some possible answers. After that, she wanted me to join her for dinner. My client enjoyed eating spicy food but none of her friends or family enjoyed spicy food. We had exchanged mail previously and found that we both had a liking for spicy food. She had already found one of the spiciest Nabe restaurants in Nagoya and made a reservation. After making our way to the restaurant we entered, took a seat and decided what we wanted to eat. I then helped my client with the paper work which had been mentioned earlier after that our meals arrived and we chatted while we ate. She asked me some questions about what it was like living abroad ( because she was thinking of doing the same one day). And also asked me questions about my country. The rental period was for 2 hours. So after the 2 hour period was up we talked about the possibility of meeting again, paid the check and went home. I've had clients ranging from housewives to businessmen to ramen chefs to entrepreneurs to bohemian outcasts – a motley cast of characters. Once I was asked to work in a Ramen shop to take orders from Russians, because apparently the Ramen shop Master "couldn't understand the Russians." I've done interpretation work between Italian businessmen and a Japanese apparel firm, but most of the work involved making reservations at onsens for the Italians. I've been in front of and behind the camera for modeling and photography work, behind a desk as a freelance journalist and webshop master, a private mail courier for digital products, Santa Claus… YES, Santa Claus, an English teacher, a flyer boy, a bar server, and a BIG buyer of Switzerland-made outdoor clothing for a Japanese Trading company. 7. Have you run into any problems while running this service? Yes, but not the kind one would bemoan about. Actually at present there are simply too many orders to fill for our current line-up of two foreigners. This is the scenario we envisioned, and to ratchet up both the supply and demand we are working in earnest to promote our service via virtual channels, magazines and ultimately word-of-mouth. 8. 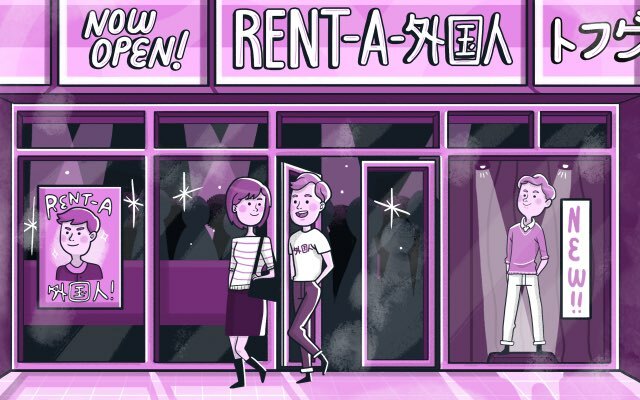 What's the best success story of someone using gaikokujin-rental.jp? It would be difficult to only talk about the best success story and not mention all the really good ones. On the Japanese side of it, students have increased their TOIEC scores, hobbyists have procured parts and various nick-knacks from abroad that otherwise could not have been gotten, local businessmen have been fed detailed information on foreign market trends, party-goers have been entertained, and the list goes on. On the foreigner side of it, success is in the MAGIC. The magic being that once your profile goes up online at Gaikokujin Rental you can get paying customers who deal with you directly. Furthermore, your new customer is an in-road into their own network – ehem, your new network. 9. What are you hoping to achieve with gaikokujin-rental.jp? In a word, symbiosis. We want to turn the disconnect between peer-to-peer business into uber-connection! To us growth means lots of little success stories the length of Japan, new networks forged, smiles, and satisfied customers. We plan to make this happen by staying online as a professional go-between for that all-important first connection between Japanese and foreigners. For Japanese, we hope to attract anyone and everyone, including businesses, who seek to employ foreigners in one way or another. For foreigners, we hope to attract everyone from young transplants to long timers to even those residing abroad who perhaps offer services via the Internet, and in general anyone here who seeks odd-jobs, freelance stuff, part-time work, one-off arrangements, and basically new money and customers. That's teachers of all sorts, musicians, caregivers, models, IT people, photographers, artisans, entertainers, self-proclaimed ambassadors and more. So there you have it. At first I thought Gaikokujin Rental was some kind of joke. Something someone put up as a kind of commentary about how "differently" gaikokujin were viewed in Japan. Or, at the very least I thought it was a hobby that a couple of dudes set up because they thought there was an opportunity to make some extra yen. It turns out, in my opinion, to be a pretty smart business idea. Of course, they have to find new people on both sides (Japanese and gaikokujin), and they are eventually going to have to deal with the problems that come with bad experiences, etc., but in Japan I can see this business model working. Anywhere else? Not so much. Just imagine if there was a "Rent a Norwegian" company in America, where you would get your Norway-related needs filled. There would be a small mob outside the Rent-A-Norwegian office demanding that this racism stops. In Japan, however, I doubt this is going to be seen as racism. There's actual need for gaikokujin-related tasks in Japan, as was illustrated in the stories above. A Japanese person needed an opinion from a foreigner about a gift for her foreign husband. Some people needed someone who could speak English. Another person just wanted to eat spicy food with someone (which I can attest to, Japanese people don't know what "spicy" really means). I hope they keep on trucking along and start to grow and do okay. Maybe we'll see if we can meet up with them and see what they're doing the next time we're filming in Japan.